He’s getting mighty cantankerous in his senior years….stubborn too. I’ve called him some ten times already; still he refuses to budge. It’s not his hearing that is the problem. I could whisper one word…cheese…and he’d shoot down the stairs like a missile. No, it’s not hubby that I speak of though his stubborn streak is long and deep. I’m talking of The Poodle, of course. With leash in hand I stomp up the stairs miffed that I even must. The Poodle, comfy in his…my…study chair is aware that I am none too pleased. I stand before him with the look. He complies but ever so reluctantly. He’s almost sloth-like as we make our way down the stairs. But then, as I reach for his smart winter coat that is in a pretty wicker basket by the front door his energy picks up—he practically runs in the opposite direction. Rocket-man howls with laughter. Me? I’m peeved. “Yo…Brando….get over here,” I all but bellow. Clearly, I am not in the mood for games this morning. I suppose it’s the stress of the season. My house looks like a bomb went off. I’ve got boxes of Christmas decor all over the living room. I’m behind in everything–from laundry to Italian, and a list a mile long of stuff to do…. which makes no sense at all since I’m not a working gal. How is it I got more stuff accomplished when I worked full-time, took care of kids, went to school and trained for marathons? Finally The Poodle inches his way back to the front door. I sit on the floor and coax him into my lap. Looking into his eyes I whisper, I love you as I caress his head and torso. Then I begin putting on his coat. With his tail down between his legs he looks awfully pathetic….like he is being punished for some far-flung reason. I’m practically gushing with “good boy” praises as he lets me arrange his coat on properly. If he could talk I’m sure he say: I much prefer my own coat, thank you very much. Except for this morning. My boy snarls right back. If fact he’s barking and pulling as if he wants a piece of them! Whoa! What gives?! Not five minutes later he does the same thing with another dog–a chocolate lab. Normally my boy is as easy-going as a Sunday morning. When we are out of ear shot range I stop and order my boy to sit. He complies immediately. If he could talk he’d probably say: You weren’t too chipper this morning either mom….like you humans, we have our bad days too. Now take off this damn coat…. As we head back home I take in, once more, the delicious quiet of the morning. Yes, my Poodle-love…we were two peeved peeps this morning. And really, there was no good reason for mine! There are far more pressing matters happening all over the world to get one’s tinsel in a tangle over. Let’s go home and make things right: it’s off with the coat and a treat for you and Christmas singing whilst trimming the tree for me. I’d much prefer my own, stylin’ black coat, thank you very much! Rocket-man notes that I have been on edge lately. Remember, he’s über Mensa smart! He doesn’t have a PhD. for nothing folks! Aside from concern and angst over my aging parents and uncertainty about a plethora of things, what could possibly make me feel edgier than usual? Perhaps it’s because I gave up all cheese for Lent? OK…well maybe this no cheese thing is affecting my mood just a wee bit but in all honesty I’d say it’s because of that $@#!-ing bird! Yes, indeed…. unfortunately the saga of Mr. Harold Headbanger, the Northern Red Cardinal, continues. Folks, he is still alive….and who would have thunk it so after hours upon hours of head-butting the windows for over a month now. More importantly, The Poodle is still alive! Quite honestly for a moment, if you would have asked me yesterday, I would have told you he’s hanging on to life by a thread. Point in fact: I was just nodding off to a lovely afternoon siesta… when ….yes…you guessed it! And no, I was not a picture of loveliness for a few minutes. My salvation (and The Poodle’s) was espresso and a chocolate biscotti. To maintain a shred of sanity I was forced to ship The Poodle off to doggie day care for extra play days last week just so that I could have a respite from a day of barking. I vented to my California friend, Miss Lou, just the other day. She is The Poodle’s biggest fan (after Rocket-man and me naturally). Miss Lou, is partially responsible for bringing this bundle of four-legged joy into our lives; without her, it quite possibly never would have happened. “The barking is making me stir crazy, “ I tell Miss Lou. “I’m ready to ship The Poodle to China!” Miss Lou is quite sympathetic and she is just as amazed as I that this bird’s behavior has continued on for so long. She lets me vent which I appreciated enormously; unloading is often all that is needed to calm the storms within. Note: A window dressing does not deter a stupid Cardinal! So….A week ago I had leaned a large garden rake against one of the windows in an effort to deter Harold’s head-butting behavior to that particular window. 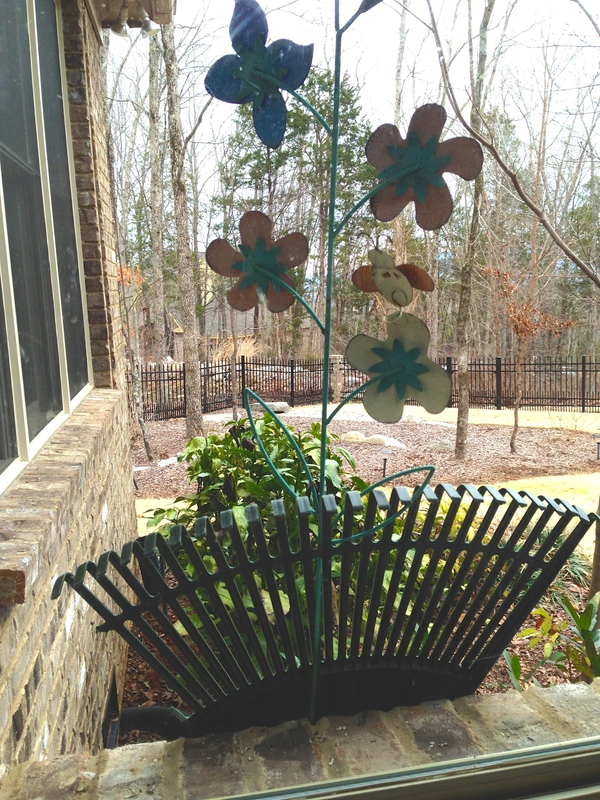 I even affixed a metal lawn ornament of flowers to the rake to add additional confusion for the bird. For two entire days Harold didn’t touch that window so I thought I had won that battle at least. “Not so fast,” the damned bird seemed to say. Sunday at precisely 6:15 a.m. while Rocket-man and I were perusing through the Sunday paper, Mr. Harold Headbanger was up and at ‘em, this time going around the rake propped up against the window. Simply amazing! The Poodle immediately started barking..a lot…which of course compelled me to follow with a couple of expletives. It’s too early in the morning to start this barking nonsense! I haven’t even finished my first cup of espresso! Not a calm (nor spiritual) start to a Sunday to be sure. “There’s got to be a way to get rid of this **&^@#! bird,” I yell. I can pull the shades down on the eight windows in the family room/kitchen area but I can’t do anything about the large window area that spans the second floor (I don’t have a ladder that will reach that window). This appears to be Harold’s favorite area. Sigh…..
My head is starting to pound (far too early for that!). I need to get out of the house and away from this bird…. Fortunately it’s a gloriously beautiful morning. So I grab my iPod and ear buds and with one command, “Go Car,” The Poodle leaps with knowing joy to run to the car. He LOVES car outings. We head down the hill and minutes later we are parked and ready for our 7-mile walk on the local “green-way” path that cuts through the Robert Trent Jones golf course. The sun is shining and after months of bitter cold it is finally warm enough to need only a light jacket. I’m thoroughly enjoying a fast walk with The Poodle while listening to a Mozart playlist when we come upon a group of twenty or so people all dressed in camouflage hunting type attire. The Poodle and I stand, a good distance away from the group, to observe for a few minutes. I watch mesmerized as a fellow behind a camouflage duck blind throws a duck toy out into a marshy area. Then another fellow some distance away in the opposite direction instructs his dog to sit and stay before yet another fellow shoots a bb-gun into the air. The dog is then instructed to “Go…Fetch.” And he does so brilliantly; shooting off from his master’s side like a rocket, running at lightening speed, then slowing to sniff around for a moment or two until he finds the duck toy, retrieves it, and returns straight away back to the feet of his master. Cool….I’m thinking …maybe this would be good training for The Poodle. After all, he needs a new activity, other than barking at a stupid Cardinal all day long. I look down at my boy. What was I thinking? The poor dear was already lost with fear just over the pop sound of a BB gun! With his tail between his legs he’s pulling me vigorously in the opposite direction. His eyes say it all; “Get me the hell out of here, please!” Of course I quickly comply. I don’t want my baby traumatized. Now If only he could agree to stop barking for me. That would be sheer bliss.